Tapjoy, a mobile monetization and advertising firm, ran into Apple’s (s aapl) ban on incentivized install campaigns earlier this year, which effectively killed off the practice of offering virtual goods in games to iOS users in exchange for downloading an app. The practice had helped fuel a lot of growth for Tapjoy, but it got the attention of Apple, which apparently felt Tapjoy and others were unfairly gaming the App Store rankings system because of the way they boosted certain apps into the top ranks. Tapjoy has shifted over to Android (s goog) (which has no ban on incentivized download campaigns) while it continues to offer a marketplace in iOS apps that exchanges virtual currency for watching video ads or signing up for services. But now, Tapjoy is getting back into the business of helping drive downloads of iOS software with a new web app called Tapjoy Games that allows it reach out directly to consumers. There’s also a new native app for Android. A Tapjoy representative said Tapjoy Games wasn’t created in response to Apple’s ban, but was designed by Tapjoy to be more of a direct channel to consumers to help them earn currency and discover apps in exchange for doing certain actions. IOS users who visit Tapjoygames.com on their mobile web browser sign-up once and link the web app to their phone, which allows any actions they take in the web app to be reflected in any games on their phone that use the Tapjoy SDK. The web app, or the Android app, will be able to sense what apps are loaded on the phone and can offer virtual currency or credits in those games if they complete a task. That includes downloading another app, watching a video ad or signing up for a subscription service. If users want to find new apps or Tapjoy Games doesn’t see any games on the phone that it can offer virtual goods for, users will see a list of some suggested apps to download. Some have wondered if this is just an end run around Apple’s ban, because users can still get virtual currency in exchange for downloading an app using the web interface. That’s a valid question, though I don’t think it will have the same effect as the old incentivized download campaigns had. Those ads were placed inside apps, and so it was easy to download an app on impulse just to get more virtual cash when playing a game. Tapjoy Games will have no links to the mobile ads, so users will have to go out of their way to visit the portal. The bigger picture here is that Tapjoy is making a direct pitch to users. It’s betting that if it can become a go-to destination, then users won’t necessarily wait to see a Tapjoy ad in an app. They’ll go directly to Tapjoy and find ways to interact with their advertisers. If Tapjoy can build up a reputation for offering good rewards for popular games and helping people discover new ones, it can grow its footprint and live outside of mobile ads. I still have to hear more about this model, and it looks like Tapjoy won’t be unveiling it formally until next week. But as it stands right now, I don’t know if it will trigger a response from Apple. As as a web app, it may have trouble getting noticed by users, so its effects could be limited on iOS. And since it may not drive as much traffic to certain apps, it might not be accused of gaming the system. Also, its unclear what Apple could do even if Tapjoy was successful with this portal. Apple might also be miffed by the fact that instead of paying for virtual goods in a game, of which Apple gets 30 percent, users can go straight to Tapjoy and get it for free. Again, I’m not sure what Apple can do if Tapjoy Games exists as a web app, but I’ve always thought that another reason why Apple isn’t in love with the incentivized download model is because it loses money on lost virtual goods purchases. We’ll see if Tapjoy can succeed with this Tapjoy Games. It really has to drive awareness about its destination portal. I’m told that Tapjoy.com will soon become the Tapjoy Games portal, instead of the B2B site it is now. But for consumers to turn to Tapjoy, the company will have to spend some money to get the word out. Still, it’s another sign of a company moving to the web to succeed on iOS outside of Apple’s rules. The Financial Times, (s pso) for example, removed its native iPad app in favor of tablet and smartphone optimized web apps. This might be not turn into the easy tool Tapjoy’s previous incentive system was for download-hungry developers, who were often able to pay their way into the top 25 rankings with Tapjoy campaigns. But that’s a good thing. Those ads inflated the value of downloads, and made a lot of download numbers suspect. 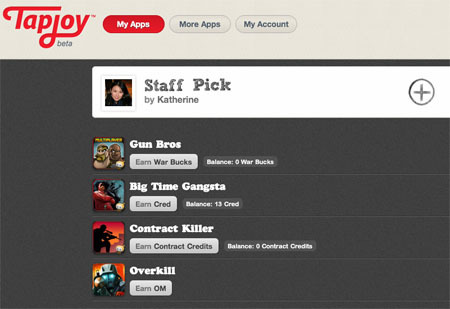 Now, Tapjoy is getting more into the straight app discovery game, while dangling virtual goods as a reward. App discovery is a crowded market, but the added appeal of in-game currency might be a way for Tapjoy to set its system apart.